Benefits: Calms the brain, strengthens the back, stretches the knees. For those new to yoga, a common beginner yoga pose is, Easy Pose (Sanskrit name is Sukhasana). This yoga pose is also k nown as sitting cross-legged and is not always as “easy” as it looks. Many new students tell me that they cannot sit with their legs crossed for very long. Some people are not able to sit cross-legged at all! What can we do? 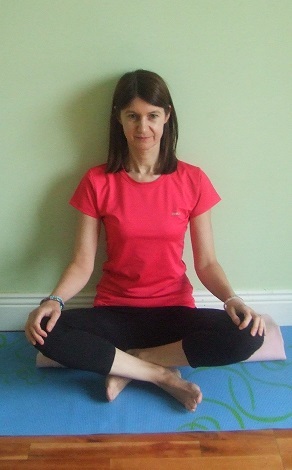 A couple of modifications that you can try in this seated pose is to first, sit on a couple of folded blankets. You may need 2 or 3 until you can get your hips higher than your knees. Place your hips on the edge of the folded blankets so your knees have room to lower down. This helps relieve the pressure on the low back and knees. Also, try a few blankets under your knees for support. If your ankles are hurting in this pose, you can slide one foot in front of the other instead of crossing your ankles or place a blanket under your ankles. Also sitting up against a wall will help support you as you progress and your body adjusts to this posture. Slowly progress to a few inches away from the wall as you grow stronger. As you are sitting in this pose you will want to keep your spine straight. You will notice that your back muscles may fatigue and slowly being to round. When you notice this, see if you can, once again, straighten your spine and breath. As you progress in your yoga practice and your back and hips become more flexible, you will find this pose a little friendlier. If you are still finding that cross-legged pose is not for you, then you can always sit with one knee bent, or both legs out in front of you. Find your own version of this pose and adjust it throughout the class so that it works for you and your body. Remember with any yoga pose, please stop if you have having pain, listen to the signals your body is giving you and ask the teacher for modifications. For more new students tips and tricks, click here.